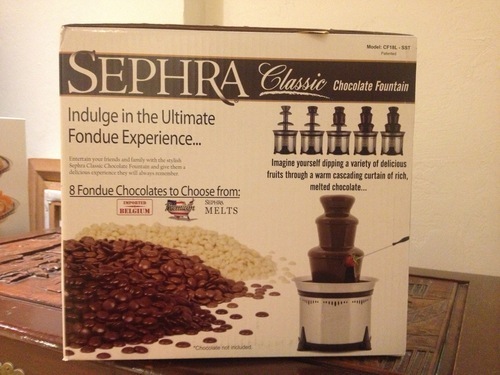 The Sephra Classic Home Fondue Fountain is the ultimate accessory for every fondue lover and home entertainer. Elegant styling and dishwasher safe parts, including our WhisperQuiet motor, make the Sephra Classic Fondue Fountain the perfect addition to any special occasion. It not only delivers a beautiful curtain of warm cascading chocolate, but can also be used for other fondue favorites such as: caramel, cheese, BBQ sauce, and even Ranch dressing. The QuickSet tiers allow for quick and easy set up and clean up. Each fountain comes with six metal fondue skewers. Q: Is the box with this product? A:Yes! This is an awesome product! Q: what is working voltage of Sephra Classic 18 Inch Home Fondue Fountain CF18L-SST? As I know Sephra has version 220V fountains. I was concerned that this wouldn’t work or would be very noisy. I was pleasantly surprised to set it up for a party filled with caramel and have it work really well. Everyone enjoyed it and it was an event for the party itself. Be careful when comparison shopping this item. This one does NOT include chocolate, others do. The box comes with a place for chocolate but you’ll notice the description does not include chocolate. I purchased this fountain for my daughter’s 16th birthday party…and wasn’t disappointed at all. It was a huge hit with the teenagers. And it was very easy to clean up afterwards. Definitely impressed. We’ll be using it many more times, I’m sure! Bought this product for a weekend party of about 25 people. Thought it would be entertaining for the kids. Ordered through amazon prime, received it in two days. Popped it out of the box on the day of the party, set it up, made sure it was level, and then melted a few pounds of Belgian chocolate bars over boiling water. Added in some oil, testing the consistency with the funnel provided. Took several iterations of adding a little bit of oil to get it right. Turned on the heat in the fountain, poured in the chocolate and turned on the fountain. Worked like a champ, cascaded perfectly. Put out some marshmallows, pretzels, strawberries…marshmallows were the favorite (they ate a whole bag of them). Everybody loved the fountain, the chocolate was amazing too. Over time, the flow started to leave gaps, as the chocolate cooled down. I probably could have made the chocolate a little runnier with more oil, but didn’t bother. They were mostly just dipping out of the dish part. I had no problems with clean up (because my wife cleaned it:-). She did it immediately after we turned it off…just poured out the chocolate and then wipded out the pan. The fountain part was washed in the sink. She said it was easy. I would recommend this fountain.